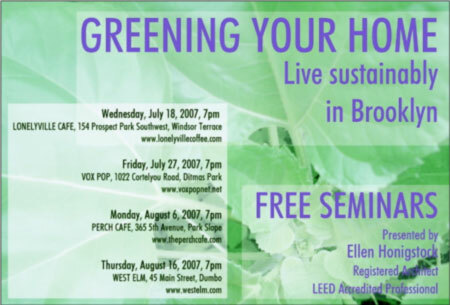 Browse: Home /	Energy Efficiency, Events, Renewable Energy / Sustainable Home Design Seminars coming to Brooklyn! 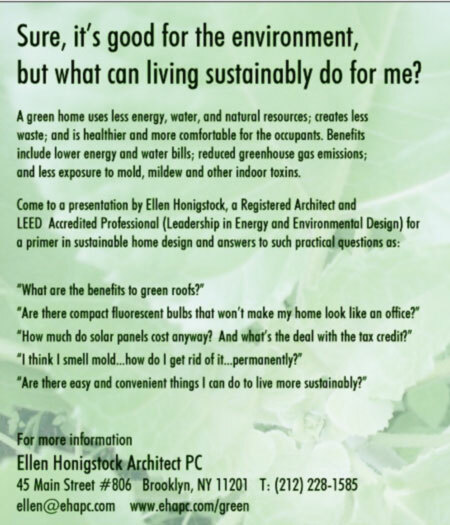 Four free seminars conducted by Ellen Honigstock, a Registered Architect and LEED Accredited Professional. A green home uses less energy, water and natural resources; creates less waste; and is healthier and more comfortable for the occupants. Thanks for posting this. The first one at Lonelyville was a little damp – from the rain and the exploding city – but a good start. Hope to see you at Vox Pop!